I present to you the Perrine sweet Hawaiian rolls beer French toast bake! Featuring an extraordinary bourbon oak aged blackberry Altbier and fresh blackberries. And brown sugar, of course. Way to have beer for breakfast! It is so sweet and so moist that you may not remember the maple syrup. 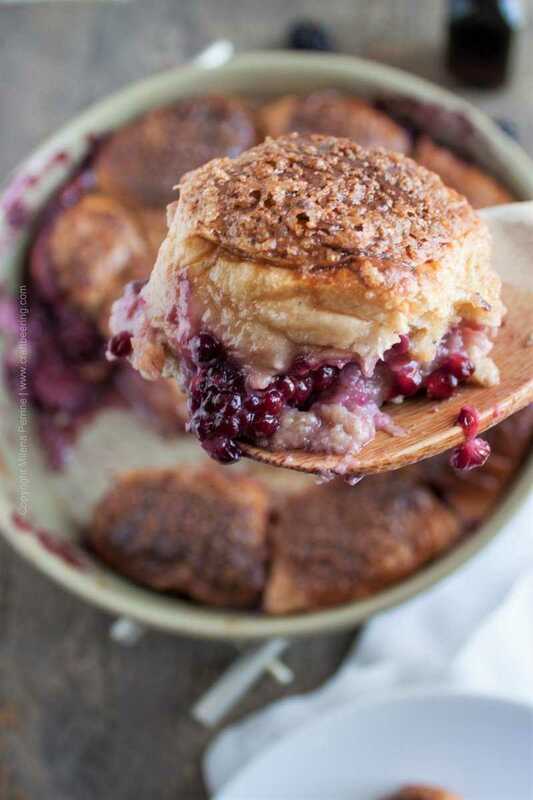 The crunch of the caramelized sugar on top contrasts the softness of the rolls, seconded by the blackberries, which even though having released a lot of their juices during baking manage to stay in one piece and somewhat firm. We make this specific version of beer French toast bake with store bought sweet Hawaiian rolls, but if you have a good recipe for those, by all means bake your own. Nothing like homemade. It is a good idea to let the rolls sit on the counter covered with a cotton towel for a few hours before you use them. Only so that they can dry out a little bit before use. The loss of moisture is much to the advantage of this recipe – it is later replenished by the beer, eggs and a tiny amount of cream that flavor this bake. In the world of beer French toast (there is a world like that, I promise, we’ve visited there on multiple occasions) the styles of beer that are commonly used are not only well balanced, but are on the sweeter and boozier side of the spectrum. In result of using these beautiful, strong brews you get unmatched fragrance, flavor, sweetness and softness to the bread…Beer is liquid bread, never forget that. In all likelihood there was beer before there was bread. Per historical evidence. Styles we the Perrines embrace 100%, yet we chose to use the not as boozy Altbier in this recipe. Here is why. Chris brewed an extraordinary bourbon oak aged blackberry Altbier. He had wanted to make an Altbier for a long time and when he finally did just had to age it in bourbon soaked French oak chips and use blackberries in the second fermentation. He did great, the beer tastes divine…I definitely lucked out in marrying him. This brew (his latest if not counting the Dunkelweiss that is currently being bottled conditioned) is one of his best ever. It rivals the Cherry Bourbon Ale he made last spring. Remember the Croissant French Toast Cups we prepared with it? Altbier is a German style dark ale, top fermented by a special yeast strain that actually functions very well in cooler temperatures. A lagered beer with ale yeast in other words. It originated in the German town of Düsseldorf a few centuries ago and for the longest time didn’t have a formal name. In 1838 it was labeled Alt (literally ‘old’) by the proprietor of Düsseldorf’s Brauerei Ferdinand Schumacher – the town’s oldest brew pub. The Altbier name gained popularity and is still used to describe the style today. In general Altbiers are dark, smooth, yet crisp and clean, with good carbonation and soft fruitiness. Low hop flavor and not very boozy. Average ABV tends to be just below or just over 5%. Clearly, we urge you to try Altbier when making this beer French toast bake if you can lay your hands on some. But since it is not the most popular style out there, use any one of the options we offer below as an alternative and select the fruit you want to add according to the yeast esters and aromas of your chosen beer. Or use nuts. Or coconut shavings. Just make sure the bitterness of your brew is very subdued or absent. And here is how to make it in a few easy steps! 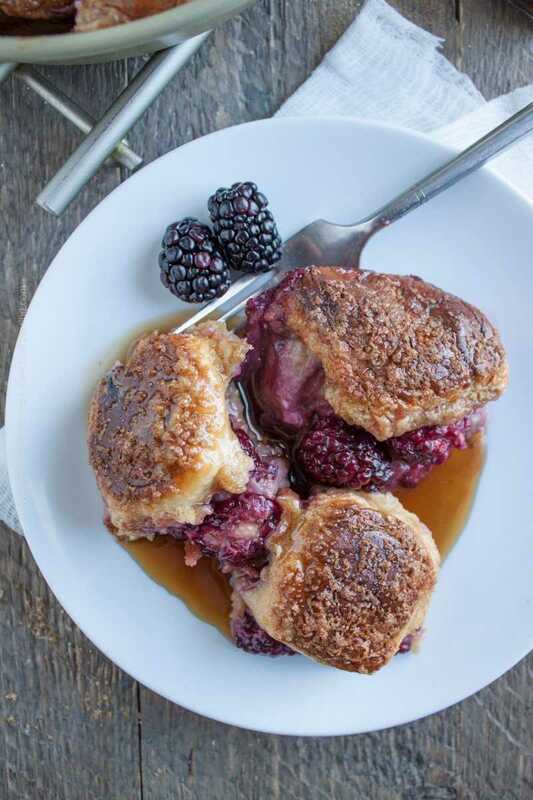 Sweet Hawaiian rolls drenched in a sweet beer, eggs and cream mixture, joined by blackberries, butter and brown sugar and baked to perfection. Tough to share. In advance take out the sweet Hawaiian rolls form the package, cover them with a cotton towel and leave them on the counter for a few hours or preferably overnight to dry out. Slice each roll in half and separate the bottoms from the tops. In a bowl whisk the three eggs, add the cream as you continue to whisk and then the beer. Place the bottom halves of the rolls into a non-stick round cake baking pan (8 inch is a perfect size) or another non-stick baking pan of similar size. 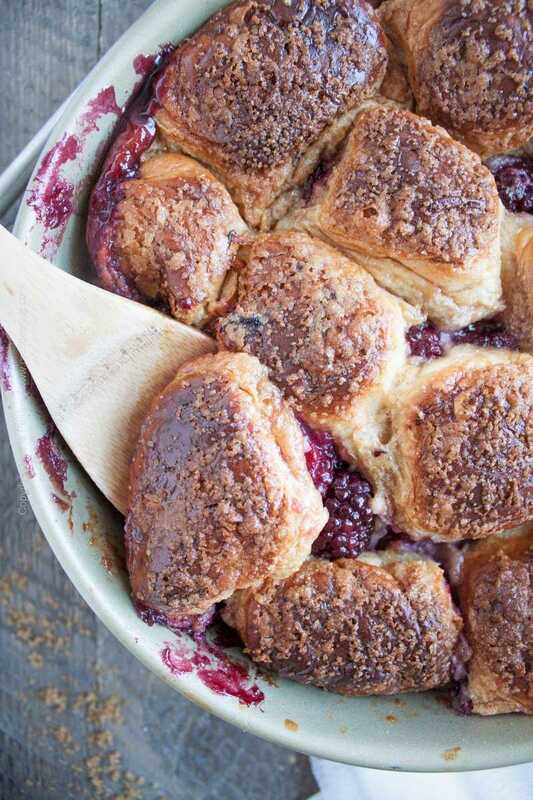 Disperse the butter pieces and the blackberries over the rolls and sprinkle with half of the brown sugar. Pour half of the egg, cream and beer mixture. Arrange the top halves of the rolls - try to match the bottom halves. Pour the rest of the egg, cream and beer mixture, sprinkle the remaining brown sugar and gently press with your fingertips to make sure the rolls get submerged in the liquid and absorb it. Bake in the 350°F oven for 15 min, then reduce the temperature to 300°F and bake for another 15-20 mins. Once the rolls have risen nicely above the rims of the pan, the brown sugar has caramelized and the liquid appears to have been fully absorbed, take the pan out of the oven and let cool off for at least 5 mins before serving. 🙂 I am sure you can make them pretty fast! Thank you, Marvellina! What a fabulous Brunch dish, this is awesome! Thanks so much for sharing with us at Full Plate Thursday. Come to next weeks Thanksgiving party on Tuesday at 8:00 am, CST, see you then! Your pictures do this recipe justice. The pictures are so good, that I want to eat this right now! This looks so delicious, and the recipe is so unique with the ingredients! Mmmm. I keep saying I want to start eating healthier and get back into shape…but then I keep seeing your recipes! Yum. Thanks so much for sharing at the #happynowlinkup! What an amazing version of a French toast! Love the crispy top, and that wonderful moisture of the rolls with the beer, cream and blackberries! I wish I had it this morning for breakfast! It is mildly addictive:) Since its so easy to put together. Thank you, Nicoletta! WHAT. This looks like the most beautiful thing. 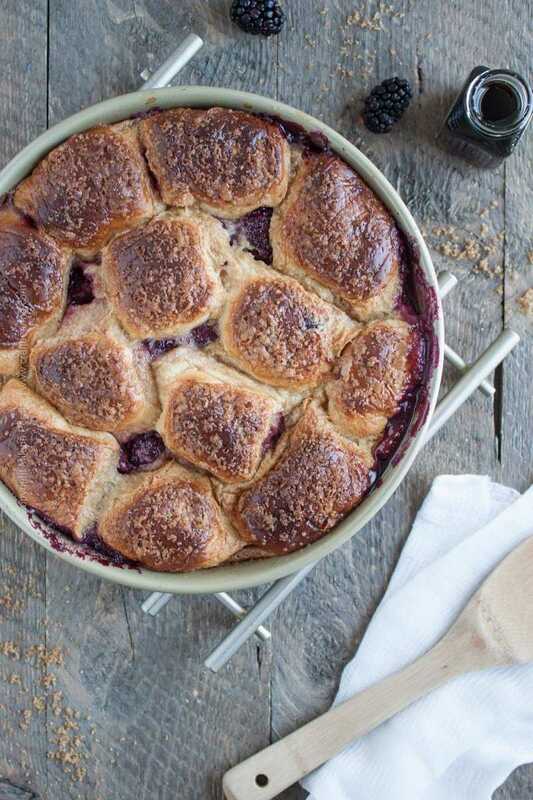 This is so creative and I am loving the flavors coming together in this unique casserole! I can almost hear that crunch! 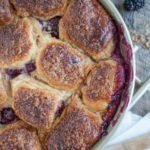 I love blackberries and anything made with Hawaiian rolls is always a winner! Always! Good good stuff! Great video!! wow! this looks amazing! would be amazing for a saturday brunch with friends!!!! I hope you’re planning on serving this tomorrow because I’m on my way to your house right now. This looks sooooooooo good! Blackberries are my favorite and all I want to do right now is a face plant right into that dish!